Goku, Son - Goku is turn back into a kid by an accident wish made by Emperor Pilaf. Goku is still consider funny, non-intellectual in work, caring, and a loving father (grandfather). He a heart of a fighter and getting stronger is his number 1 goal. He befriend with Ubuu. Goku goes on a journey to retrieve the seven black star dragon balls. He was able to reach Super Saiyan 4 while fighting Bebi Vegeta Oozaru. 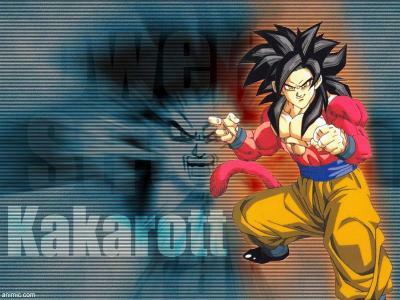 Goku was no able to controlled his body under the Golden Oozaru form. He never did regain his adult self back (until the ending theme).